The Border Collie originated in the border country between Scotland and England as a sheep herding breed. They were set apart by their ability to use 'eye' to control stock and work stock in many different settings. Some dogs were used to find and herd individual or very small groups of sheep on the moutain side - calling for extremely intelligent dogs who were able to work independently at great distances from their handlers. Some dogs were used to move flocks from the mountains to the market towns for sale, calling for dogs who were confident and sure on stock under pressure and in different environments. Still others specialised in working closely on stock in yards and this required a stronger, more forceful type of dog. These dogs came to Australia in the late 1800's and became immensley popular as working dogs. They have gradually diversified with the breed being recongnised as a 'show type' as early as 1907. Since this time the Border Collie has made its mark on every aspect of a dog's life in Australia, these dogs are well known still as working dogs, but also excel in dogs sports like Agility, Flyball and Obedience and are very popular as family pets. 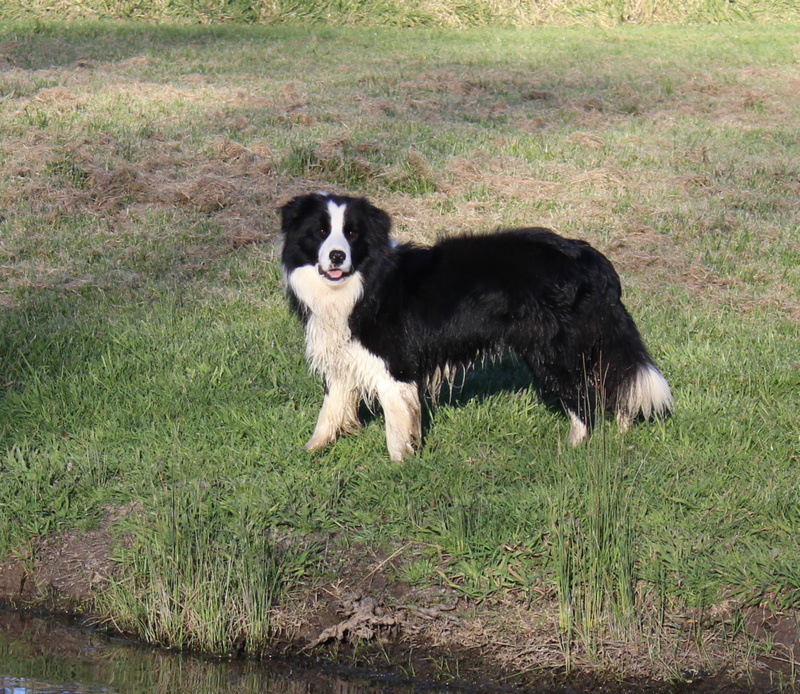 When you are looking at adopting a Border Collie (and many other dogs) two health issues are frequently discussed, the genetic health of the dog and hip & elbow scoring. The hips and elbows of any dog can often be impacted by injury, disease or deterioration. This impacts the dog's quality of life and often, the whole family. When adopting a pup you can enquire about the parents' hip and elbow scores which can give you some guidance as to the soundness of the pup. Hip and elbow scoring involves xrays being taken of an adult (more than one year old) dog's hips and elbows and a specialist then examines the xrays and gives each joint a score. The score can be expressed as the number for each joint: 1:1 or as a total combined score: 2. The highest possible score for hips is 53:53 or total 106, and the border collie average is 6.3 total. When looking at these scores, the lower the number and the more even the number the better. For example, 4:4 is better than 1:7 even though the total score for both is 8. Elbows are scored in Grades - Grade 0 (normal) Grade 1, Grade 2 & Grade 3. The numbers represent degrees of change from normal. When looking at these scores, the lower the number and the more even the number the better too. There are several diseases which can affect Border Collies which we can test for and ensure that they do not affect our dogs. This disease stops the puppy's immune system working properly, and pups often die because of infections. They very rarely survive beyond their first few months. This is an inherited eye condition where parts of the eye do not develop properly. The condition can impact the dog's sight a little, or a lot. It does not progress so some dogs can live with the impaired vision it causes. This is a very rare condition where the dog's body cannot remove waste products from the blood. This waste builds up and kills off brain cells. This leads to problems with movement, vision and behaviour. Symptoms do not appear until the dog is an adolescent and most dogs who develop the condition cannot survive. Colour: Black and white, blue and white, chocolate and white, red and white, blue merle and the tri-colour black, tan and white. In each case the basic body colour must predominate and be the background colour of the dog.